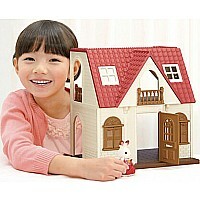 This Cozy Cottage comes fully assembled and ready to play with everything you need for hours of pretend play fun! Includes a removeable floor piece to either create a 2nd floor or expand the 1st floor! Includes Bell Hopscotch Rabbit, bed with matching sheets, floor piece, table, chairs, sink and stove/oven combo, food and more! Combine the Red Roof Country Home (sold separately) and Red Roof Cozy Cottage to create a mansion! For children ages 3 and up. Measures approximately: 11.42 x 8.46 x 11.61 inches..